Wow,I remeber that one watching them fry in the rising lava back then heh. Pretty cool change on the warp zone wall area that used to be sealed off. You have the color lava lights looking right,Sure seems like that was in the single player game? I'd say i wish it was bigger mabye by 1/3. 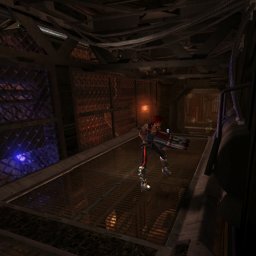 Quake or no Quake, this is a well constructed map which runs and plays well. 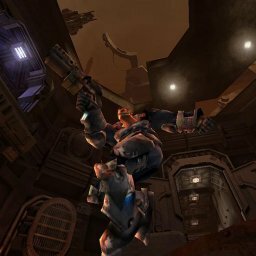 @gold - this _is_ a quake 2 map. the map was a secret level found (iirc) right after you first find the rail gun near the little waterfall area - the map is called "fact3". 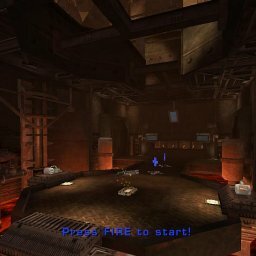 online it was used as a 4-player ffa or as a basic "duel" map. Never played many Q2 Usermade Maps and would have not known this was a remake at all, though the Map Construction style seems very Q2ish. That said, this is a great Map and even though it is basically a remake, the Detail is UT2k4, simply excellent! ...I have beat quake 2 on all difficulty modes and have seen every multiplayer map on the Nintendo 64, but I don't recognize this map. Sure its not from Q3?